If you were to pause your life at this moment, what aspects are you grateful for? What positives, however ordinary, do you wish you could freeze in time? People’s reasons for gratitude vary by individual and this exhibit asks viewers to confront their own gratitude lists and really sink into them - either in their head or shared on an interactive communal piece. To “press pause” is to literally put into words and identify one’s blessings. No matter how crappy of a day/week/month/year someone is having, there is always something positive than can be brought into focus. This exhibit was born out of a conscious acknowledgement I had as I found myself standing in the stage of life where my kids still believe in Santa, everyone is generally healthy, my parents are still with it, the bond between my husband and I continues to grow stronger each year, we have goals and travels to look forward to, my body is able to keep up with the physical demands I place on it, I have the freedom to create artwork I love… If only I could continue life frozen in this phase - before health fades, before loved ones die, before these wrinkles further deepen, before my kids lose their innocence… but since time won’t pause, our mindsets must. By taking stock of our gratitude, we recognize that all things are temporary and without guarantee. We savor and honor the present and don’t take things or the people around us for granted. Every piece in this exhibit has 2 vertical rectangles – a nod to the pause symbol – some more obvious than others. Housed on the back of each original artwork is a blank card for the buyer to fill out their own personal gratitude list. The untitled artwork is then titled according to the day it is purchased - representing a marker for that person’s pause of reflection. As artworks are generally hung for a span of years, their list will serve as a time capsule of sorts, to be revisited when the painting is moved years down the road, and the list has inevitably shifted. 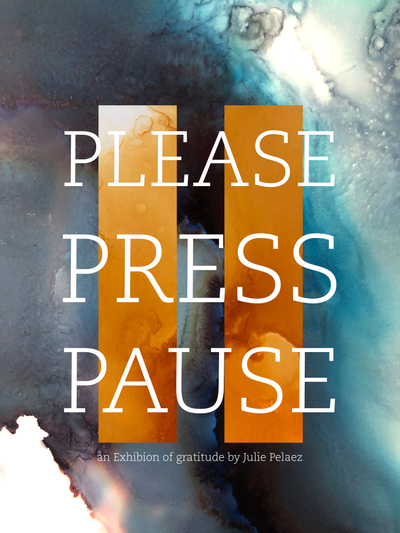 Please Press Pause is a reminder to us all to savor the present and observe our lives through a lens of gratitude. Between the time this exhibit was conceived to present, a loved one has been diagnosed with, and is now currently battling Non-Hodgkins Lymphoma. A percentage of each purchase from “Please Press Pause” will be donated to a non profit of the Julie's choice. (TBD).